Only one in 10 people age 18 to 34 live under the same roof as their parents here, compared to one-third of millennials nationwide. Kaila McLean never planned to become a “boomerang kid.” That term, if you’re not familiar, refers to the growing number of young adults who’ve moved back in with their parents after living on their own, usually for financial reasons. After earning a degree in integrated energy management from Central Washington University in June, McLean, 24, landed a job in her field back home in Seattle. She began looking for her own place — and that’s when she ran smack into the grim reality of one of most expensive rental markets in the nation. One apartment she checked out recently was a 409-square-foot, rent-subsidized studio in Kent, only eligible to people making less than $45,000 a year. So for the time being, she’s back in her old room at her parents’ house in Seattle’s Magnolia neighborhood, saving up money for her own apartment. McLean is among the one-third of Americans age 18 to 34 living with their parents, which has overtaken living with a spouse to become the most common household arrangement for people in this age group in the U.S. But among her peers in Seattle, McLean’s situation is much less typical. Census data show that in the city, only one in 10 18-to-34 year olds — about 23,000 people — live under the same roof as their parents, despite the fact that the cost of living is so high here. That’s not just a significantly lower percentage than the national average. It’s also extremely low among major cities. 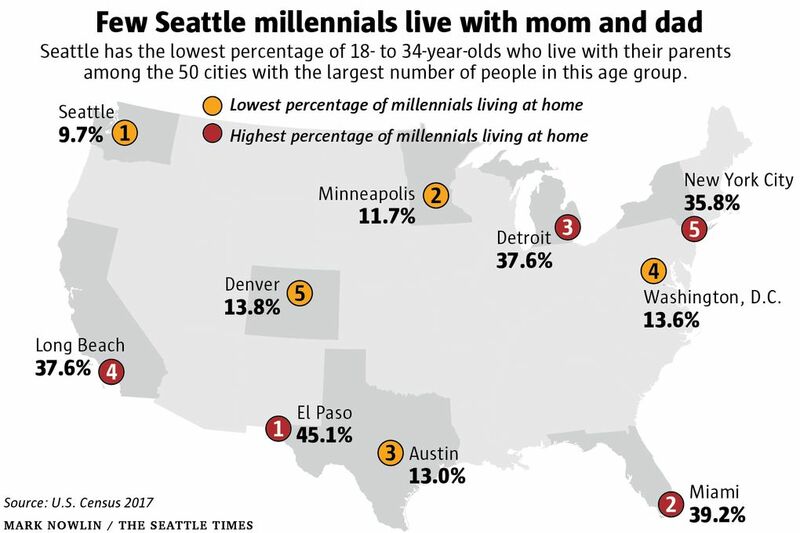 In fact, among the 50 U.S. cities with the largest millennial populations, Seattle’s 10 percent who live at home is the lowest. Why is Seattle bucking this national trend? There are probably a number of factors, but one that surely plays a role is the fact that so few young people who live in this city are actually from here. Seattle is a magnet for millennials from around the country and the world, which means that their parents live somewhere else — boomeranging is not an option for them. Interestingly, we also see a relatively low percentage of young adults living at home more broadly across the Pacific Northwest, says Jonathan Vespa, a demographer with the U.S. Census Bureau who has studied this trend. “In Washington and Oregon, it’s only about a quarter of young adults who live at home. That’s lower than most other states,” he said. “The Northwest is different even than, say, California, where about 38 percent of young adults are living at home.” Overall, the Northeastern and Southern states have the highest percentage of millennials staying with their parents. After Seattle, the cities with the lowest percentage of 18-to-34 year olds living at home are also places that have attracted a lot of young newcomers this decade: Minneapolis; Austin, Texas; Washington, D.C.; and Denver. 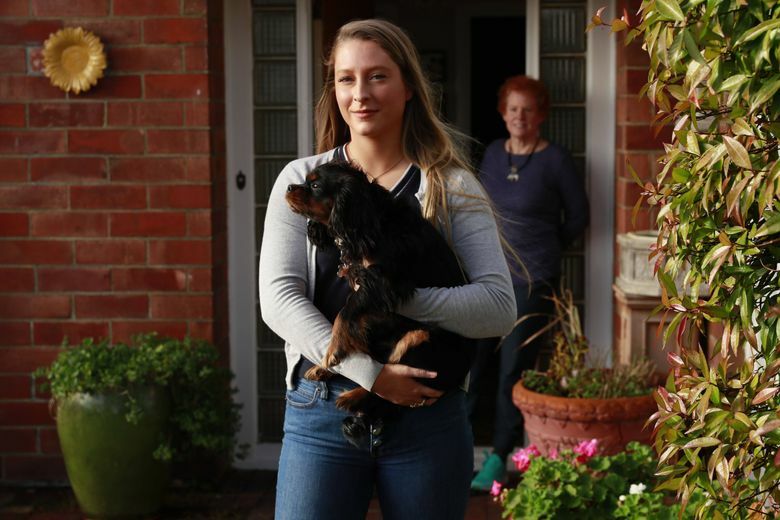 One factor behind the trend of young adults living at home is the record-high average age of first marriage, nationally now around 29 for women and 30 for men, Vespa says. Household formation in the United States is often tied to marriage. With young adults staying single longer, they are less inclined to create their own household. About 80 percent of millennials who live at home either work or go to school, the research shows. But among the remaining 20 percent, one in four report having a disability which makes it hard for them to live independently. “It kind of changes the way we think about living at home for this generation,” Vespa says. When it comes to their living arrangements, Seattle millennials are exceptional in some other ways, as well. Among the 50 biggest cities, we have the highest percentage of 18- to 34-year-olds who live alone, and the highest percentage who live with an unmarried partner — both are at about 16 percent. And just 6 percent here live with a relative other than a parent, which is the lowest percentage among the 50 cities. 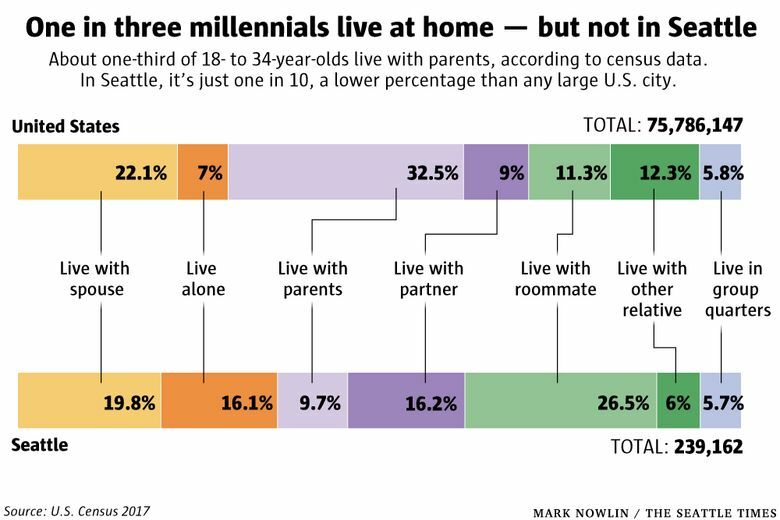 That said, Seattle millennials are typical of their peers around the nation in a couple of categories, including the share who live in a married-couple household. About one in five here live with a spouse, which is very close to the U.S. average. Another 6 percent live in a “group quarters” situation, such as a college dormitory, which is also close to average. But the most common arrangement for someone in this age group in Seattle is to share a living space with a roommate — more than one in four do so. Among the 50 cities, Seattle is one of just 11 where roommate situations are the most common living arrangements for millennials. In most of the cities — 31 of them — living with parents is most common, reflecting the national trend. The remaining eight cities are a throwback to an earlier time when living with a spouse was the most common situation for young adults. As if to confirm the data, McLean says that nearly all her Seattle friends live with roommates, many of them sharing tight quarters. “They’re all living out on their own and I’m here with my parents and they can’t come over to hang out because my mom goes to bed at like 8 o’clock,” she says, laughing. While McLean says she feels a little embarrassed to be 24 years old with a college degree and still living at home, she’s grateful to have the option — and she concedes that living with her folks is not so bad.